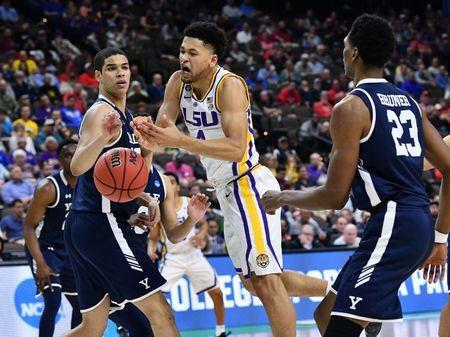 Naz Reid and Kavell Bigby-Williams both had double-doubles as third-seeded LSU used its superior size to hold off 14th seed Yale 79-74 in the first round of the NCAA Tournament East Regional on Thursday afternoon in Jacksonville, Fla. The Tigers (27-6), regular-season champions of the SEC, scored consistently in the paint and shot 60 percent in the first half as they built a 16-point halftime lead before holding off a second-half charge of the Ivy League champion Bulldogs (22-8). LSU, playing without coach Will Wade -- suspended while the school investigates possible NCAA violations -- will play sixth-seeded Maryland in the second round Saturday. Maryland beat 11th-seeded Belmont 79-77 on Thursday. Reid had 14 points and 10 rebounds, Bigby-Williams had 10 points and 10 rebounds, Skylar Mays added 19 points and Tremont Waters scored 15. Alex Copeland led the Bulldogs with 24 points, Jordan Bruner scored 16 and Azar Swain had 12 off the bench. LSU led by 18 points early in the second half before Yale started cutting into the lead. Copeland made two layups and a 3-pointer to spark a run that reduced the lead to single digits at 55-46 with 12:14 to play. The Bulldogs pulled within seven points on five occasions despite going nearly five minutes without making a field goal. Bruner's steal and layup reduced the lead to five, but Reid answered with a layup with 2:09 left. Yale kept fighting back, making four 3-pointers in the final 42 seconds, but the Tigers answered by making nine free throws. LSU scored the first nine points of the game and led by nine on two more occasions before Yale started to get on track offensively. The Bulldogs pulled within 19-17 and 21-19 but they couldn't catch the Tigers. Waters passed to Bigby-Williams for a dunk that pushed the margin into double figures at 34-23 with 5:31 left in the half. 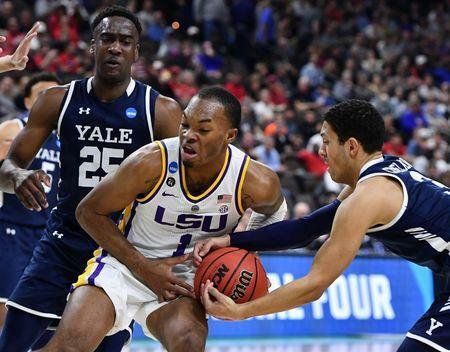 Yale briefly cut the deficit back to nine before Waters led an LSU push down the stretch. 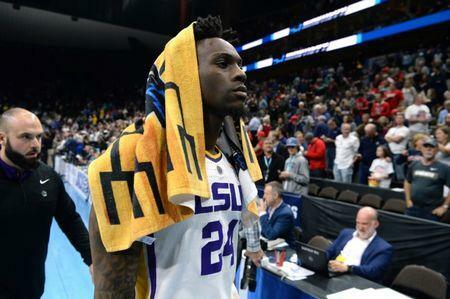 He scored five of the Tigers' final 11 points of the half, finishing with a layup that gave LSU a 45-29 halftime lead.